What is Health and Wellness Software? Wellness programs can use web-based tools to help organize and administer a wellness program. These web-based computer systems are considered health and wellness software. Historically a corporate wellness program had been nothing more than a website with health information, basically a wellness platform. The wellness platforms used now are way more than just a wellness portal that contains a health library, they are wellness program delivery and management systems. Published wellness studies show that the most effective wellness programs are focused on helping employees adopt and maintain healthy behaviors. Following this logic it is easy to see that a good employee wellness program should be an effective behavior change tool that can help employees establish healthy lifestyle habits. Unfortunately, some employers believe that having an employee wellness website is the same as having a wellness program. They mistakenly assume that all their worksite needs to improve employee health and reduce health care costs is get their employees to go online. A wellness website is not a wellness program. It’s a computer software program that can be used to help deliver wellness programming and help manage the process. Despite all of the features and benefits that come from the computer coding and programming, these computer systems are just tools to encourage and promote a healthy lifestyle. Living a healthy lifestyle is what we do when we’re not web connected. Think about somebody you know that lives a healthy lifestyle. This person most likely exercises every day, doesn’t use tobacco, eats a healthy diet, manages their stress and weight, and maintains some level of work/life balance. When this healthy person is shopping for healthy foods, making healthy selections at a restaurant, or exercising, they are not online at a wellness portal. These four objectives are the foundation of a successful wellness program that is based on behavior change. You can learn more about this behavior change process here. 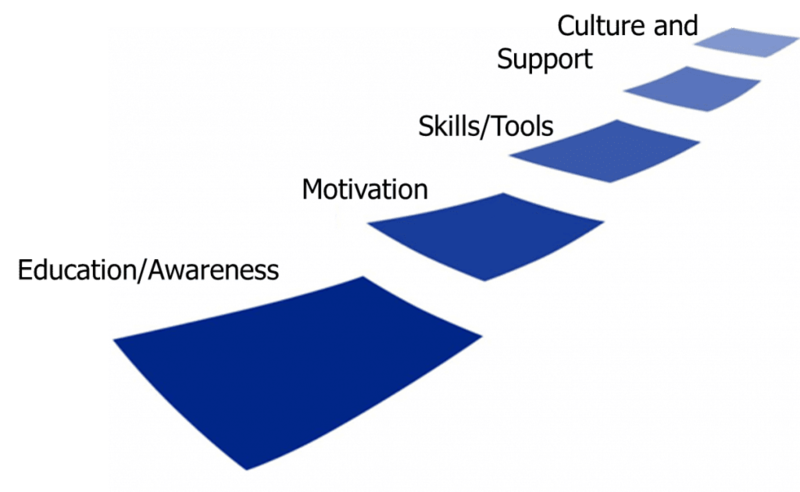 This behavior change model tells us exactly what features the best worksite wellness programs should have if they are to be effective. The next table shows the 10 features and how each one is part of the behavior change process. The first step in behavior change is to become educated about the need to change our behaviors. Most wellness programs start off with a personal health assessment and a biometric screening. The results from these assessments create awareness for the aspects of our lives that need to be improved. Whether done on a computer or a mobile device, wellness portals can make it easy for individuals to report their personal health risks and understand the results from their biometric screening. The education and awareness part of behavior change is the easiest part to do. Wellness portals assess individual health data, make recommendations, and encourage people to improve. The challenge is to gather the data and provide the education in a simple, easy to understand format. 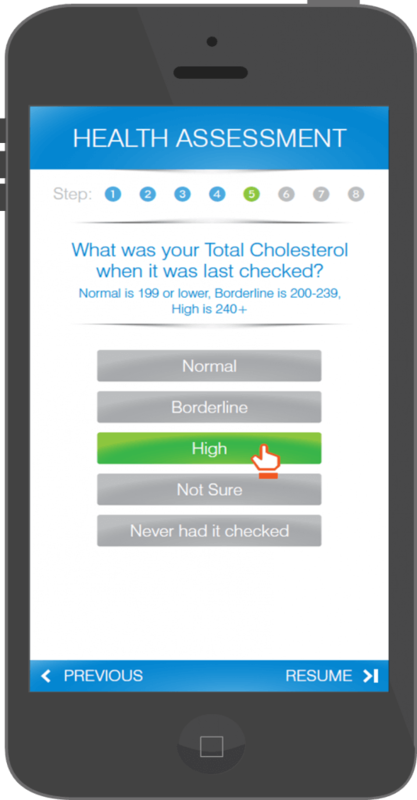 Taking a personal health assessment on a mobile device is about as simple and easy as it can get. There are dozens of ways to educate employees about the need for healthy behaviors. A good wellness program is going to use video content, live presentations, webinars, books, audio files, social media, and individualized feedback to help individuals understand the importance of adopting and maintaining a healthy lifestyle. Wellness platforms do a very good job of interpreting and reporting personal health information. Here is an example of the personalized feedback from the WellSteps wellness solution. For many wellness programs, education and awareness is all they do, but you will see this is only the first step in having an effective wellness program that is focused on behavior change. Well programmed wellness systems will automatically track program participation and individual health behaviors. When we see progress we are motivated to continue with new behaviors. By showing participation and activity, a good system can help individuals see how their activity changes across time. They can help individuals accomplish their personal wellness goals, they can track data from wearable devices such as a Fit Bit or Jawbone, and they can even detect who has watched behavior change videos or completed behavior change tasks. All of this gets aggregated into live reports that allow individuals and administrators to have a dashboard view of everything going on within their wellness strategy. This is perhaps one of the most useful aspects of a wellness platform. There was a time when most wellness program participants used paper forms and printed materials to report on health risks or to participate in a wellness program. The logistics of creating, printing, shipping, and collecting these materials was burdensome. For the most part, all of that has been replaced by giving employees access to the web. Whether on a computer or mobile device, it is a lot easier and a lot more pleasant to participate than it used to be. Every corporate wellness program should be available on a computer and a mobile device. A wellness platform needs to have a mobile app that allows every employee to participate in every aspect of their program. 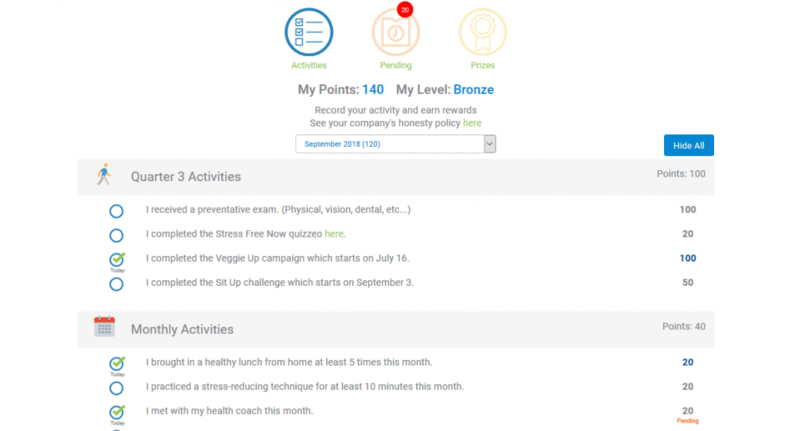 At WellSteps, we are seeing more and more employees participating in our wellness programs with the WellSteps app. 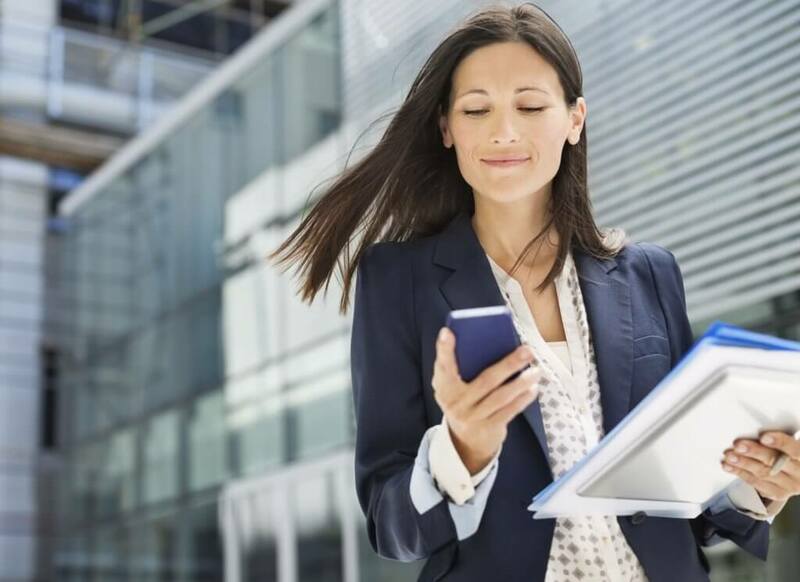 Five or 10 years from now most employees will participate with a mobile device. Well-designed and easy-to-use apps make it easy for employees to engage in your wellness program. This helps them stay motivated to have healthier lives. When we talk about motivation, most of us think about employee incentives. As employees complete different aspects of the wellness program they can earn points towards different rewards. I have written articles on the best ways to use incentives to motivate employees. Here are some of the best incentive ideas and a complete guide on how to get the most out of wellness incentives. Regardless of the incentive strategy that you use, your wellness system needs to track progress towards receiving your wellness rewards. The WellSteps Rewards Solution automates the entire process of validating, tracking, and fulfilling wellness program incentives. Historically, administering a wellness incentive plan has been labor-intensive for staff and challenging for employees. Your employee wellness program needs to greatly simplify the tracking and administration of wellness rewards. A good wellness system will do this automatically and make it extremely easy for employees to report and track their progress. The easier it is for employees to participate the more they will enjoy it and the more likely they are to acquire new, healthy behaviors. In my experience, these next three features are the most difficult to produce and the most effective if done right. Most people who have elevated health risks already know that their health is not as good as it should be. What they really need is a step-by-step approach to improving their lives. They need to know how to change their habits to make it easier to be healthy. They need to be taught how to shop for healthy foods, how to avoid unhealthy fast foods, how to be physically active even though they might have a busy schedule, and how to avoid situations where they may be tempted to use tobacco. It is one thing to know that exercise is good for you. It is another thing to decide what type of activity to do and how to do it. The how to part of behavior change is crucial. Wellness platforms can become teaching tools to give people the skills and know-how to transform their lives. This can be done with video, but it would be even better if the system were used to communicate a live meeting where real humans can communicate with other real humans to learn how to create healthy lifestyle habits. In this sense the wellness solution can also become a communication tool. Sometimes demonstrations on how to be healthy are not enough. Employees may need resources or tools to help them be healthy. Sporting equipment, gym passes, cooking equipment, vegetable cutting boards, walking shoes, recipe books, or a day planner are all tools that can be used to promote a healthy lifestyle. Without the right tools is unlikely that a new behavior will be acquired. 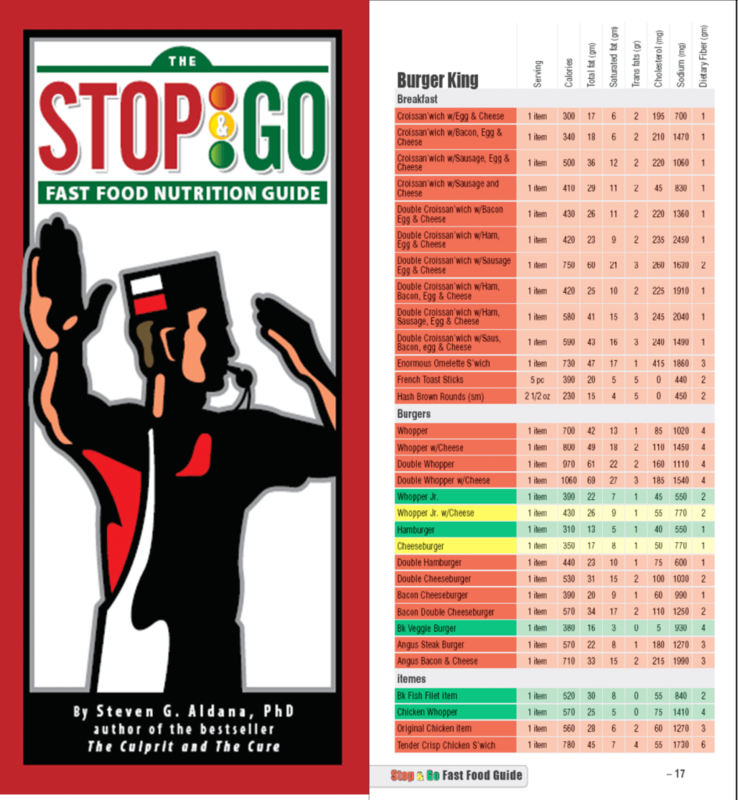 Recently, I updated The Stop and Go Fast Food Nutrition Guide. 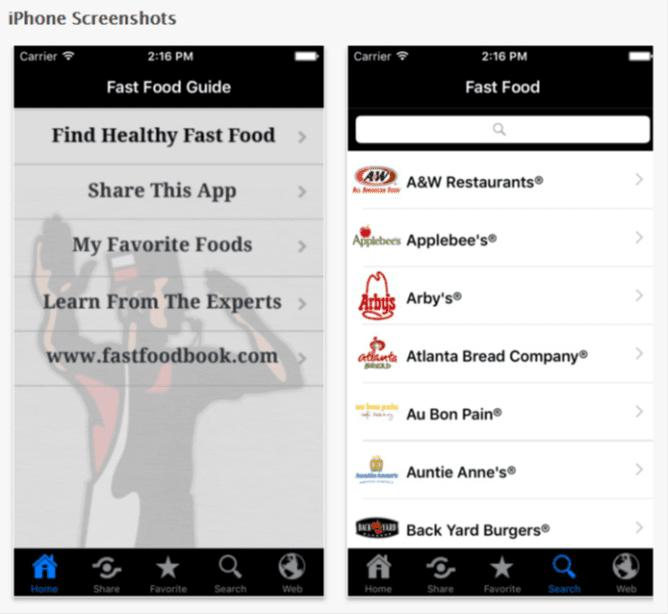 With the guide you can eat fast food and eat healthy. The new updated app is FREE. It color codes over 25,000 fast foods from 143 different restaurants. Avoid the red foods. Enjoy the green ones and your health will improve. Over 1 million people are using it, but it is just a tool. People need tools to be healthy and wellness programs should be used to share these tools. Anyone can get the FREE app here. The WellSteps behavior change campaigns and challenges are carefully designed behavior change programs that use each of the four major steps of behavior change. Each campaign and challenge is designed to help employees make new lifestyle habits. 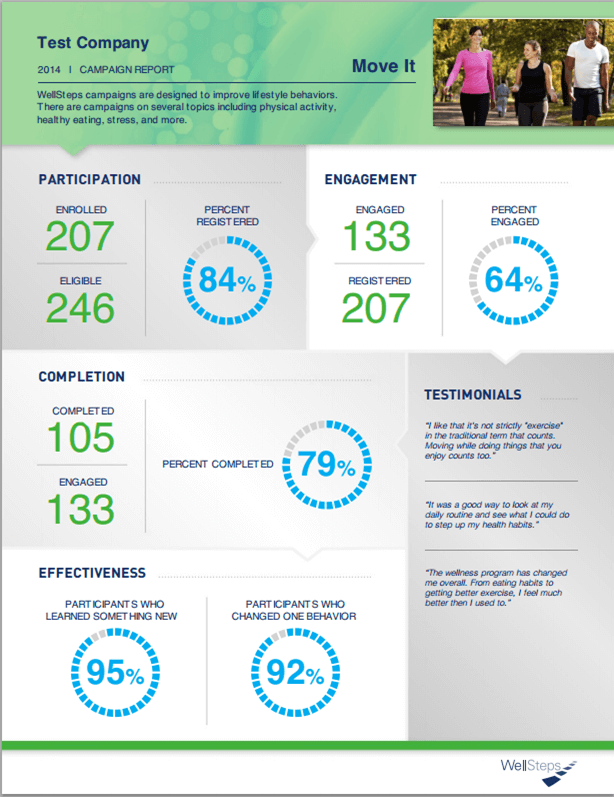 Each campaign uses marketing and communication materials, incentives, campaign materials, video, webinars, and onsite support to help employees be healthy. Most, but not all of this can be delivered using a wellness platform. For example, by watching a brief video during the Food Makeover campaign, employees take several weeks to learn which of the foods currently in their home are healthy and which ones are not. During the campaign they will take an inventory of the foods in their home. They also learn shopping secrets that help them know what to buy and how to save money doing it. Finally, they are asked to choose and prepare one meal from our library of healthy, simple recipes. This behavior change campaign helps employees eat healthier meals at home. Here is one of the videos from this campaign that is delivered via the wellness computer system. Unless you live on a deserted island all by yourself, your health behaviors are influenced by friends and family. A good employee wellness program will communicate and invite your friends and family to participate with you. Social support is key to successful long-term behavior change. Without it is almost impossible to change our diets, stop smoking, or create a daily habit of exercise. Humans are very social creatures and the support we get from others goes a long way to helping us be healthy. A good wellness computer system also has a strong social media component were successes can be shared with others. Personal stories and challenges can provide motivation for others to change behaviors. Whether it’s integrations with Facebook, or an electronic newsletter every employee wellness program needs to include effective ways to harness social support. Adopting healthy behaviors is actually fairly easy. The challenge is to maintain these healthy behaviors for the rest of your life. Worksites that can create health-promoting environments and a culture that supports healthy living will experience a variety of positive wellness outcomes. The WellSteps Guides use our wellness solution to help every single client take a good look at their worksite culture using our free tool called the Checklist to Change. Each quarter the wellness committee and worksite leadership pick one thing to change within their environment. After several years of small, consistent, culture changes, the entire organization begins to look and feel like a place where people want to work and be healthy. 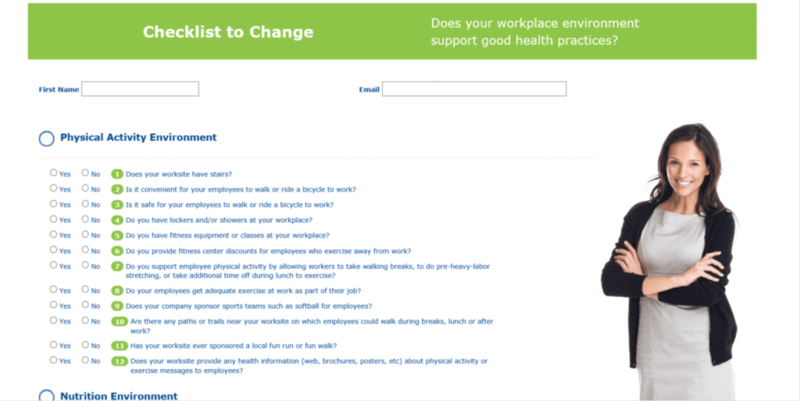 This checklist to change is delivered through the wellness portal and it helps organizations create a culture of health. Large studies have shown that 70 to 91% of all chronic diseases are lifestyle related. That means that most of our poor health and the majority of our healthcare costs come from diseases that are caused by poor health behaviors. Wellness programs that use good health and wellness software will improve employee health behaviors, lower health risks, and reduce employee healthcare costs. The WellSteps uses each of these features as part of our wellness solutions. As the winner of this year’s Koop award, WellSteps has been able to demonstrate that a good health and wellness software can make a good wellness program great. How Much Does An Employee Wellness Program Cost?